Oct. 11, 2017 - Do you remember the last time you ate a popsicle? There is a good chance that you were holding on to your icy treat with a wooden stick produced by Quebec company John Lewis Industries. John Lewis provides the vast majority of popsicle sticks to food companies throughout North America. Prior to building its first popsicle stick factories in Maine, New Brunswick and Quebec (Dolbeau, Abitibi and Grand-Mère), John Lewis Industries started out producing wooden soles in 1915. It was in 1978 that the company decided to start up the popsicle stick business, in La Tuque, Que. La Tuque is in the Haute-Mauricie region of Quebec where high quality and density white birch wood species are found, which are ideal for the production of food sticks. “[White birch] is a species that has the least effect on the taste of the food,” says Frédéric Tremblay, manufacturing plant manager of John Lewis since 2006, noting that the white colour of the wood is a confidence factor for customers. “As well, “Birch Lewis” [its colloquial name] is a Nordic birch that grows slower and has a very good density, allowing it to better withstand impacts during its transformation,” says Eric Bouchard, vice-president of manufacturing operations and corporate development at Rémabec. Rémabec took over ownership of John Lewis in 1997 in partnership with the Royal Bank Corporation and a subsidiary of the Caisse de dépôt et placement du Québec (CDQP). In 2002, Rémabec bought out its partners and became the sole owner of the business. In 2003 Chinese producers aggressively entered the North American wooden stick market, cutting the price almost in half, according to Bouchard. “There was an advantage for the Chinese forest industry when the Chinese government created tax-free zones and offered subsidies to develop the industrial zone, which enabled China to emerge with very low prices, but with a very variable quality,” he noted. From then on, U.S. customers began asking for the Chinese price with North American quality. In response to the new competition, Rémabec formed a joint venture with a Japanese partner and launched a rod plant in China. The goal was to produce North American-product quality with Chinese labour. Meanwhile, the company changed its business model to enhance the competitiveness of the La Tuque mill. From 2004 to 2006, the plant operated for four months of the year. In an effort to reposition itself in the wood stick market, the company decided to drop products such as tongue depressors and paint sticks because the quantities produced were too small and the costs were too high. 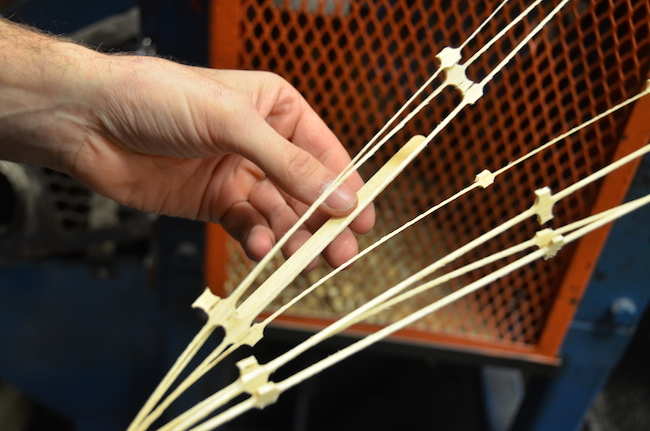 Rémabec invested in automation at the plant, which increased production from five to seven billion sticks per year. By 2009, the company once again became profitable. As for the Chinese manufacturers, when the government subsidies dried up they began to raise prices. From this point forward, the Chinese producers have turned to products with higher added value than the wooden sticks. The profit margin for each stick is measured in fractions of cents so John Lewis must produce them in mass quantities for its operation to be profitable. “Even if it’s a niche market, we only work with large buyers who have some power,” Bouchard says. Today, Rémabec makes a lot more money with the wooden sticks than with timber. “It may be 100 times better, but that’s because we do not make money with timber,” Bouchard says. The big advantage of the stick market is that prices are negotiated well in advance, thus ensuring greater stability. However, challenges still remain. In 2013 the Quebec government introduced a new forest management system that contributed to higher fibre costs. The new system set aside 25 per cent of the forest to be awarded through auctions to reflect better the price of wood. The cost of fibre increased by about 10 per cent as a result. For John Lewis that meant thinner profit margins, Bouchard says. The John Lewis factory differentiates itself from competitors by being a leader in terms of quantity, quality, cost and delivery based on customer needs, says Eric Bouchard. “We want to remove problems for our clients, meeting their needs,” says Bouchard, who wants to instill this philosophy and brand image in all the subsidiaries of Rémabec. “A stick, it has looks simple, but it’s very complex,” says Bouchard. If the geometry, thickness, colour or any other technical defect is present, the stick will be downgraded to the craft market – a market of 700 million units annually. To ensure the highest quality, the John Lewis Industries earned certification from the Safe Quality Food (SQF) Program in 2009. John Lewis Industries eventually reached its max growth in the popsicle market by supplying most of the big players. To grow, the company had to find new markets. Rémabec decided to bet on the batter-coated sausage market, also known under the generic name “Pogo”. 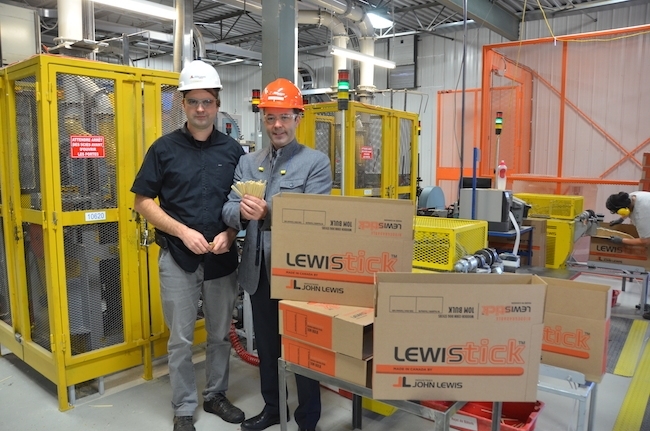 In early 2015, Rémabec invested $2.3 million to construct a new building dedicated to the production of sausage sticks. For now, two processing lines have been installed in order to produce 650 million sticks. “We are able to double our production quickly because there’s room for four machines and the building was designed to be extended,” Bouchard says. Since John Lewis Industries works in a very niche market, the development of new equipment is often done internally and sometimes with industrial partners. For the coated sausage sticks, high-speed sanders were developed with Inotech Canada to treat sticks up to 16 kilometres per hour. After two years of development, the first sales began to materialize. In a year or two John Lewis Industries intends to settle permanently in this market, which produces around three billion units annually.